Tweet I am a HUGE DORK, lover of family-themed Halloween Costumes. Thankfully, I have a husband who plays along and even gets into it himself. Last year Brenna was a Ghost and we were Ghostbusters! The Handy Husband and I made our costumes from a plain white paint suit from Home Depot which cost about $7 each. The backpacks/ghostbuster guns were assembled from spare parts from the garage and a print-out of the Ghostbusters Logo from the computer. The straps on the backpack and the red stripes on the suits are duct tape. 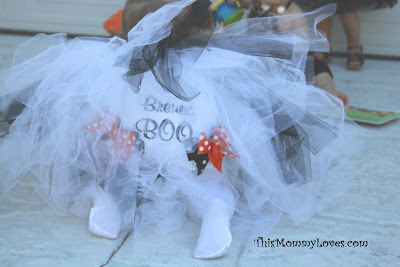 Our little ghost, Brenna Boo's, costume was a Casper-onsie purchased from Walmart for $3, a black and white tutu, and personalized bloomers from Etsy's CustomClothesForKids. In the works for this year is a princess themed family getup: Brenna, of course is the princess, Daddy will be sporting a Prince ensemble while I will be the EVIL QUEEN...muahahaha! 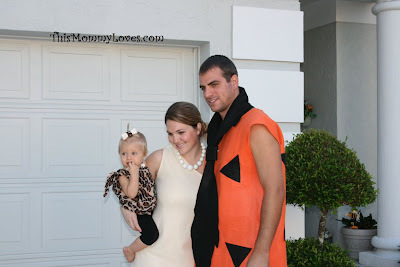 My Mommy Squader, Amanda's, family went as the Flintstones last year. Super Cute! Another Mommy Squader, Jill, did a Mommy-Daughter Cat Combo! 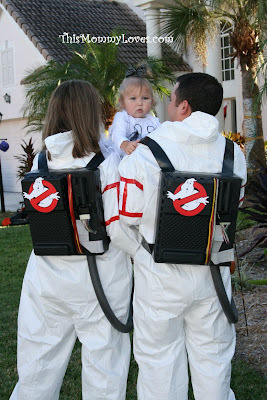 Laurie, the fabulous Tip-Junkie featured a great post about Family-themed Halloween Costumes. Check it out. Some of my favorites were this Incredibles Costume and the Condiments. Do you like dressing up the whole family? I'd love to hear about some of your favorite themes. I Love to LINK UP with the following! This is so cute! You know we never grow out of wanting to dress-up for Halloween...right? Oh so adorable! 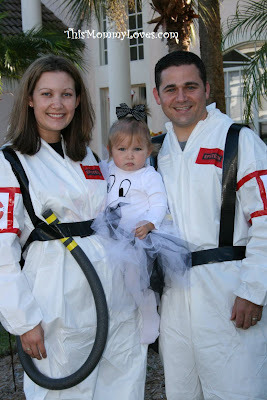 Those ghostbuster costumes are hilarious! Are they making a comeback? All of a sudden I'm seeing Ghostbusters everywhere!!! Too cute! This is great! I would love it if you would link this up the my Halloween Costume Party. Thanks so much for the comment you left on my blog! I thought I would visit yours, and I have to say, this post had me literally laughing out loud! I called my husband over to see these great costume ideas. Your ghost busters is genius! Cute! One year I was Strawberry Shortcake and my daughter was Custard. The next year, I was Rainbow Brite and she was Sprite. Then, she was a bee, me a flower and my husband a bee keeper. So glad you swung by to share your ghost costume! I think it's hilarious when I see things I've made almost exactly on other sites, it let's you know how alike we all are, I saw all those adorable onsies, and they make the perfect tutu combos, but I'm disappointed in Walmarts selection this year! . :O) I LOVE the ghostbusters theme you took! I'm sending my cousin a link now b/c I made this for his daughter! The other outfits had me laughing! Those are such terrific ideas! We appreciate you stopping by and joining us for Anything Related! I love making Halloween costumes - you have made some great ones! Submit them in my Handmade Halloween Contest - starts now! Adorable!! Love these darling costumes. aww that is adorable! I wanted to let you know of a linky I recently started on Tuesdays for the Handmade Pact. Come link up next Tuesday! Did I leave a comment saying I would be featuring this? I thought so, but I'm actually just be losing my mind. I love all these ideas and will be tellling my readers to come check this out! Thanks. So cute!!!! I got some great ideas for next year!!! a bug theme...and now this year an ocean theme. I recently did a post all about our costumes! someone sent me your blog---because my family LOVES to dress us together too---this was our 8th year. you can see our pictures on my facebook page---gina olson larsen. cute pictures!!! Ten Cent Frosties from Wendy's - Stock Up!